The Roe is a small animal, only about two feet in height. he roe belongs to the class of antelopes-animals very much resembling the deer; they are equally innocent and beautiful, and are often mentioned together in the Bible. The form of the antelope is, if possible, still more graceful than that of the deer, and its limbs still more delicate; but the principal difference between them is in the horns. Those of the deer grow from the bone of the forehead, and are at first small; but they are renewed every spring-the old horns falling off, and being succeeded by larger ones which grow in their place. They are at first covered with a soft, downy substance, called "the velvet;" but this soon comes off in fragments, leaving the horn white and smooth. The antelope never sheds its horns. The roe or gazelle is the smallest animal of the antelope kind; it is only about two feet in height, and not more than half the size of the fallow-deer. Its eyes are remarkably soft and expressive; so that the people of those countries sometimes say of a beautiful woman, "She has the eyes of a gazelle." Like the hart and hind, it is noted for its swiftness: so we read, in 1st Chronicles, 12 : 8, of men who were "as swift as the roes upon the mountains." In 2d Samuel, 2 : 18, it is said, "And Asahel was as light of foot as a wild roe;" and in the Song of Solomon, "The voice of my beloved ! behold he cometh leaping upon the mountains, skipping upon the hills: my beloved is like a roe or a young hart." 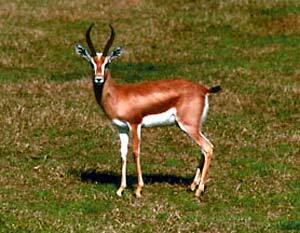 The gazelle is often pursued in the chase; so Solomon says, "Deliver thyself as a roe from the hand of the hunter." "That gush on holy ground."